Ce document au format PDF 1.4 a été généré par Word / Mac OS X 10.2.8 Quartz PDFContext, et a été envoyé sur fichier-pdf.fr le 14/03/2013 à 15:46, depuis l'adresse IP 92.155.x.x. La présente page de téléchargement du fichier a été vue 890 fois. Taille du document: 2.2 Mo (21 pages). being prepared for sale. 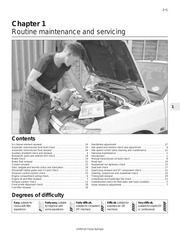 All service technicians should be familiar with this entire chapter. Air filter element (for Clean. engine and drive belt Replace if necessary. Replace coolant every 24 months. Check operation and brake fluid. Replace brake pad if necessary. Rear swing arm shafts Lubricate every 6 months. Measure the throttle to swing free play. Tighten the lock nut and reinstall the sleeve. the air cleaner housing cover. cleaner assembly from the air cleaner holder. from the air cleaner body. which may lead to a fire or explosion. Squeeze out the excess oil. riding in unusually dusty or rainy areas. Remove the drain tube by removing the clip. fender and remove air filter housing. Remove the air filter from the housing. If the element is damaged, replace it. Remove ignition coil cap and spark plug. plug cleaner or a wire brush. Measure the spark plug gap. the engine is cold (below 35¢J). Inspect and adjust the valve clearance. the lock nut is tightened. 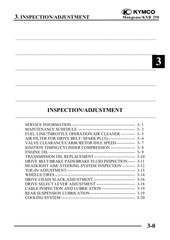 idle speed inspection and adjustment. Warm up the engine before this operation. 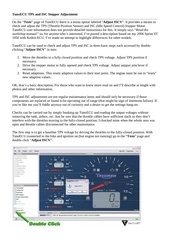 Start the engine and connect a tachometer. Remove the timing hole cap. Check the ignition timing with a timing light. starter button to test the compression. combustion chamber and the piston head. Place the machine on a level place. stopped for 2_ 3 minutes. Place a container under the engine. while the engine is warm. Clean the oil strainer with solvent. Inspect the O-ring and replace if damaged. compression spring and oil filter cap. Tighten the oil filter cap to specification. engine immediately and check for the cause. Remove the left crankcase cover. Replace the drive belt if out of specification. A wear indicator is provided on each brake. limit line, to replace the pads. level mark through the inspection window. Turn on the headlight switch. the handlebar from left to right. there is no weight on the front wheels. Check ball joints and/or wheel bearings. Move the wheels lately back and froth. bearings if excessive free play. Adjust if out of specification. Mark both front tire tread centers. there is no weight on the front tires. Fix the handlebar straight ahead. Measure the width A between the marks. Measure the width B between the marks. lengths of the rods will be kept the same. Check the front axle nut for looseness. Check the rear axle nut for looseness. Replace if wear or damage. wheel has been changed or replaced. slack within the specified limits. through the axle hub and driven sprocket. caliper holder bolt to the specification. Loosen the lock nuts of rod. Lubricate or replace if unsmooth operation. drops of lubricant to cable. Lubricate the pivoting parts of each lever. °ØWipe off the excess grease. Place the machine on the level ground. between the maximum and minimum marks. Remove the drain bolt to drain the coolant. Drain the coolant in the reserve tank. is stable. Reinstall the radiator cap. coolant up to the maximum mark. Ce fichier a été mis en ligne par un utilisateur du site. Identifiant unique du document: 00161683.